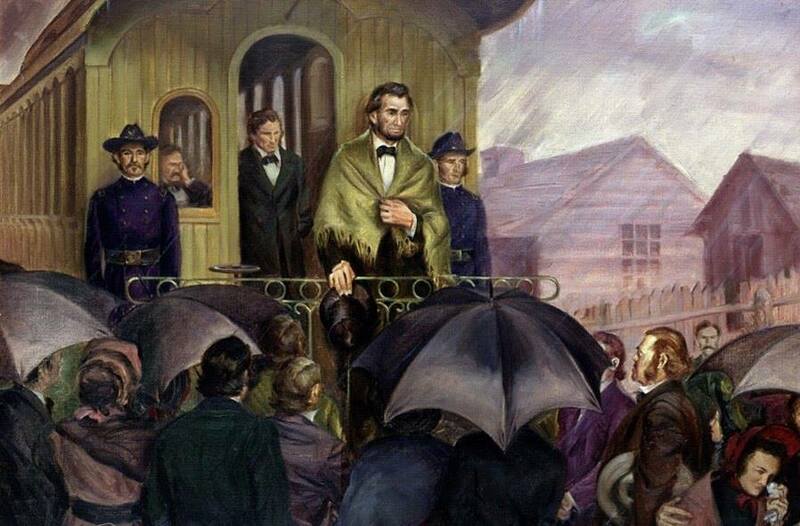 On this day in 1861, President-elect Abraham Lincoln left his home in Springfield, Ill., boarded a two-car private train and embarked on his journey to Washington, D.C. By then, seven Southern states had already seceded from the Union. The trip would take him across seven states, cover more than 1,900 miles and take 13 days. Along the way, he was greeted by enthusiastic crowds whenever the train would stop to take on fresh coal or water. His wife, Mary, was in St. Louis on a shopping trip and would join him later in Indiana. When President-elect Abraham Lincoln left his hometown of Springfield, Illinois, to take office in Washington, D.C., the local Illinois State Journal recorded the moment. The following article comes directly from the paper’s February 12, 1861 edition. 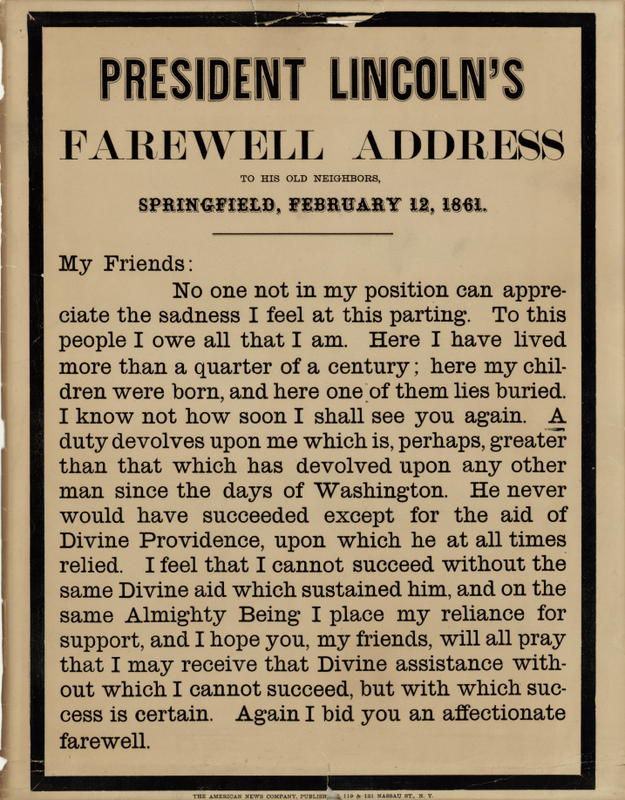 Notice how the text of his farewell address differs from the version Lincoln edited as the train left the Springfield depot. “Long before the hour appointed for the departure of the special train provided for Mr. Lincoln and suit, hundreds of his friends and fellow-citizens, without distinction of party, had assembled at the station of the Great Western Railway to tender him their respects, grasp once more that honest hand, and bid him God speed on his eventful journey. A subdued and respectful demeanor characterized the vast assemblage. All seemed to feel that they were about to witness an event which, in its relations to the future, was of no ordinary interest. It was a most impressive scene. We have known Mr. Lincoln for many years; we have heard him speak upon a hundred different occasions; but we never saw him so profoundly affected, nor did he ever utter an address, which seemed to us as full of simple and touching eloquence, so exactly adopted to the occasion, so worthy of the man and the hour. Although it was raining fast when he began to speak, every hat was lifted, and every head bent forward to catch the last words of the departing chief. When he said, with the earnestness of a sudden inspiration of feeling, that with God’s help he should not fail, there was an uncontrollable burst of applause. At precisely eight o’clock, city time, the train moved off, bearing our honored townsman, our noble chief, ABRAHAM LINCOLN, to the scenes of his future labors, and, as we firmly believe, of his glorious triumph. God bless honest ABRAHAM LINCOLN! The speech moved members of his entourage so much that after the train started, he was asked to put his words into writing. Because of the difficulty of doing so on a moving train, Lincoln asked his personal secretary, John Nicolay, to finish copying it down after a few sentences. A second version of the speech was published in a Springfield newspaper a few days later. So what did Lincoln actually say that morning? We may never know exactly but we do know both he and the crowd there were quite moved by the circumstances. An observer reported that the president-elect’s “breast heaved with emotion and he could scarcely command his feelings.” Lincoln’s words proved prophetic: a funeral train carried him back to Springfield just over four years later. This entry was posted on Monday, February 11th, 2019 at 11:11 am	and is filed under General Interest. You can follow any responses to this entry through the RSS 2.0 feed. You can leave a response, or trackback from your own site.